There is a fantastic tool you can use free to set up the perfect graphic file for your large custom vinyl, fabric, pvc scrim and display graphics and other grand format digital print jobs too. You can use it too! Everyone can use it free. At the top of each page of their site use the Easy Template Maker. Their template maker allows you to choose custom options and you can work in your preferred measurement settings too. I'll choose feet for this demo. Input the size of the banner and choose the finish options. There are many choices here because signs banners online is a factory that supply wholesale printing to many design firms, agencies and graphic designers. You can customize it all. I'm locating loop which is the female side so that I can attach my big fabric printing design to a large portable 3 stage pop up wall like you see at a red carpet or photo shoot interview, expo etc. As you move through the options other fields become available to customize your template for manufacturing and grand format banner sign printing. I'll choose white sewing thread to best match the color to my surround of the design. You can choose from 7 colors here. Then generate the template by clicking on that color button. Very quickly the template is made, there it is. Save it as a pdf. Let's make this big stretch fabric media wall for a custom exhibition trade show booth backer. OK, now you can see the template and recommendations. I'll turn on this so you can see more details, the template I opened in Photoshop [any version will do it] has colored lines. This helps you position your creative and shows the safety graphics area so you'll know where to best put the important elements within sewing so it doesn't get cut. Now it's a single layer called background. Done. You can use it free for any banner sign, fabric display, pvc vinyl banner, outdoor sign or anything that is big. I'll show you how easy it is once you have the template set up correctly. Go to ... QUOTE & UPLOAD page. Enter in a few details. Locate your flattened banner print ready file you just created. Upload. 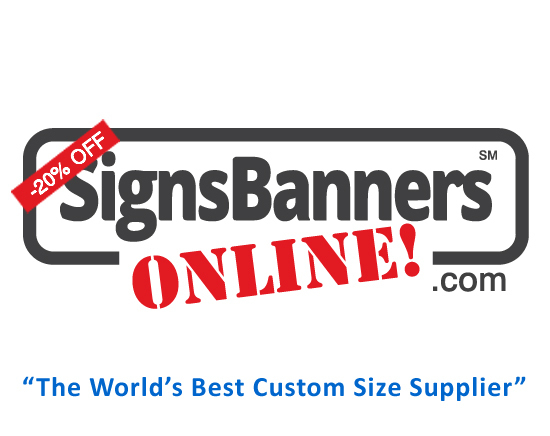 The signs banners online system automatically starts checking and processing the creative. It performs over sixty functions ready for your print. You can see the preview so that your order is correct, click approve and it goes to the sign printing factory. Their website is used by hundreds of graphic designers, sign company managers, advertising agency consultants and wholesalers everywhere. YOU CAN USE THE TEMPLATE MAKER FREE. Save it to your favorites. Start now by clicking the special 'design support page' on their website.